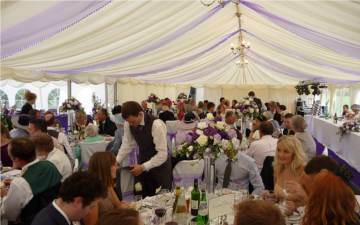 5 Reasons why a tent hire is the best option. It’s fair to say that tent hire is becoming ever more increasingly popular for all types of events and solutions for hire. So whether you are planning a wedding reception, birthday party, corporate event or garden party, the tent hire possibilities are really endless!! Here are just 5 reasons to choose tent hire. One of the many benefits of hiring a tent is that you can virtually have it wherever you like (within reason of course!). Whether you choose to have it on the grounds of a country manor, farmers field, local village green, sports ground or just in the comforts of your own back garden, there is much more flexibility when it comes to tent hire than holding special occasion in a standard venue. The tent you wish to hire will fit your grounds. Best location found if your chosen grounds have major dips. Grounds are suitable for pinning down a tent or if weighting is required. Ideal locations for entrances, exits and catering tent are suggested. If your looking for grounds to stage your event then visit our marquee venues page to find your ideal location in the midlands. 2. DESIGN YOUR PERFECT EVENT. When it comes to the interior design of your event, it’s like working from a blank canvas and the choices are endless. Modern tents are available as full clear span marquees, which means that there are no pillars to support the roof or obstruct any views of the event. This gives you free reign to design away in an open, clear space. From choosing the theme, colour scheme, furniture, lighting and layout, you can be sure that your event will be truly unique. You are not restricted to a fixed layout as you may find with many traditional venues and extras such as the bar / dance floor can be situated wherever you like. With all tents and marquees it’s all about being unique and making your ideas come to life. 3. EVERYTHING ALL ROLED INTO ONE. Planning an event whether it be a wedding, party, awards ceremony or corporate dinner, can be stressful. There is a lot to think about when it comes to entertainment, décor, tables, dance floors, bars, lighting, chair hire etc. Most marquee companies can offer all these important extras either from within their own company or working with other firms that they use regularly. This can be a lot cheaper than some venue hire costs where you have to source in all your own suppliers and manage their delivery and set up also. Everything literally can all be rolled into one supplier, which is guaranteed to make your life A LOT easier! Another big advantage when booking with a tent hire company is the choice of catering options available to you. With most venues they will require you to use their own caterers who have their own set prices with little room for negotiations and even worse their food may not be to your taste. Sourcing your own caterers gives you more menu options and also control of your budget. Your caterers can use our catering tent so your guests receive food to your taste and at a price you have more control over, whether it is food sourced locally, buffet style or canapés, the choice is unlimited and flexibility is all yours. It really is that simple, so let your imagination run wild as you have total control over your event and the whole atmosphere. From creating your very own unique venue, to deciding what time your event starts and finishes, tent hire lets YOU decide all these important factors which would be restricted within a venue setting. To get yourself pricing on our services use our Marquee Quote Form or contact us on 0116 288 9566.